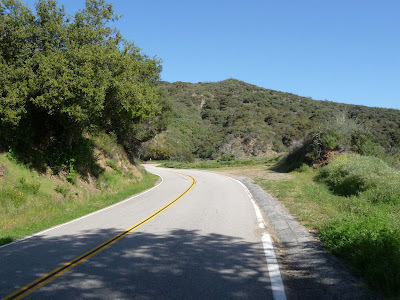 Sometimes the need for the endorphins out weighs all other rational thought and you find yourself on a warm sunny Sunday afternoon pedaling up Glendora Mountain Road. I hit the sweet spot of the afternoon. Warm on the way up. I stopped at the first saddle. I noticed other cyclists headed down bundled up like skiers. It was surprising the chill in the air on the way down. Be aware of the stick on the road as it moves. On Big Dalton Road at 3:00 pm Saturday afternoon just before the yellow gate, Tom cycled past a three foot triangular headed snake with 1.5 - 2 inch tail. That's 8-10 segments of rattles. Adult hood. He rustled up a branch to move the snake off the road, but the branch was not long enough. The snake moved towards his bike then up over the edge of the road by the guard rail. 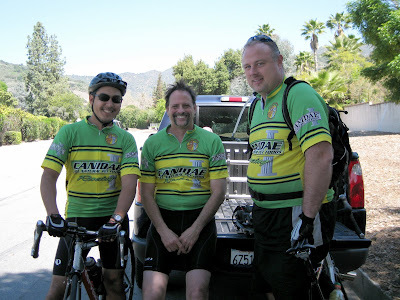 On Saturday, met up with Jason, Carl and Kevin of bicyclefriends.org as well as Matt and John, GMR regulars. A very determined Kevin made it to the first saddle. Kevin works for a metropolitan water district. With the emergency water rationing in effect, he reminded me that I don't have to time my showers as 70-80% of the water usage is on landscaping. I hauled my bike up to Newman's averaging 7.9 mph. Carl headed back at Newman's to rejoin Kevin for the ride down. Jason, Matt and I rode to the maintenance shed. John joined us at the shed. He talked about his yo-yo ride plan. Forgot to mention that I was excused from jury service. Bill rode to the first saddle. Life on the road is good when you are retired. Sometimes life forces you to destinations you don't want to be, but it beats the alternative. 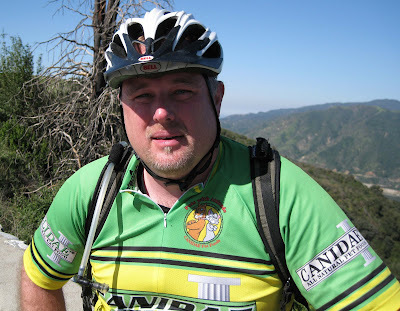 Met Phil at the top of Monroe Truck Trail heading home from Santa Clarita. 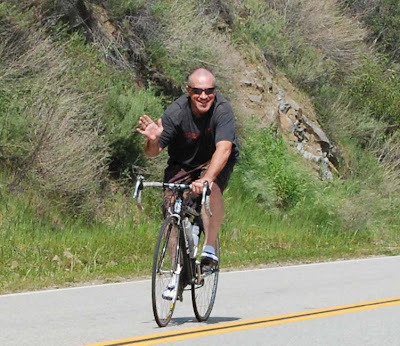 He rides Palomar regularly, but enjoys the gentler nature of Glendora Mountain Road about once a month. His recommendation is to ride Palomar mid week when there is less motorcycle traffic. Same for GMR. He mentioned the Everest Challenge. Two days of three monumental climbs each day, with a total elevation gain of 29,035 feet in 206 miles. 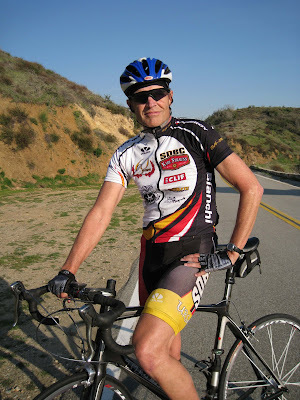 Bill took a ride in the morning around Puddingstone. He likes ducks. The storm broke in the early afternoon. The cotton candy clouds hung on crystal clear skies. The warm sun beckoned with gusts of a brisk cool wind. 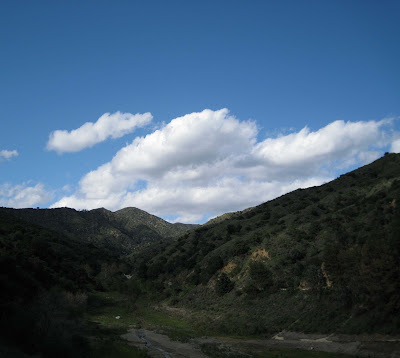 I hiked behind the ranger station on Glendora Mountain Road. The wind whipped my hat off. The view was worth it. The high rises of downtown Los Angeles were visible. The view to the north along Camp Wolfie. 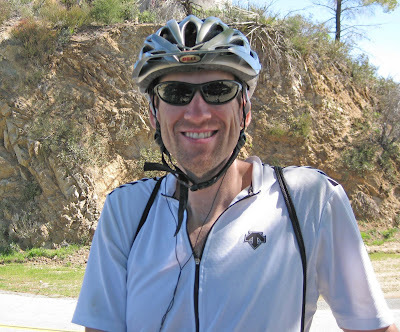 I have been under the weather this weekend and did not get out to cover the two additional stages of the 2009 San Dimas Stage Race. No race. No riding. Plus Rain. This weekend has been a bit of a bust. Amid the backdrop of the cyclists daring to face the mountain on their wheels, a few interesting stories emerged on Friday along with the sun. A couple of business clad spectators seated on the guard rail at the bottom of the Monroe Truck Trail rode the mountain monthly. I hope to see them in their Sprague Ready Mix jerseys some time soon. 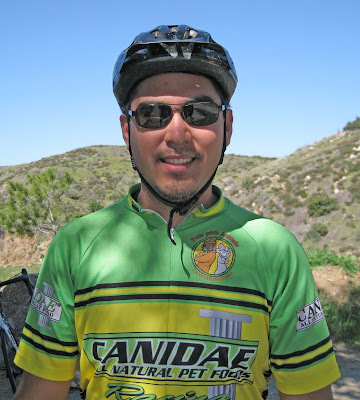 Jason of bicyclefriends in his green Canidae jersey was spotted riding down. I shouted but he didn't stop. Could I have been mistaken? Dennis a regular who walks his dog every day up the mountain stopped and chatted. His partner was left at home as the loud speakers used by the announcers frightens him. Dennis caught sight of the Nikon D80 slung around my neck. He worked for the company and pointed out the fact the old cameras are worth something now. Marianne a recent psychology graduate of Berkeley wrote for the upcoming Women's Cycling Magazine. The site launches on March 23, 2009. She was pleasant company on a hot afternoon hike. 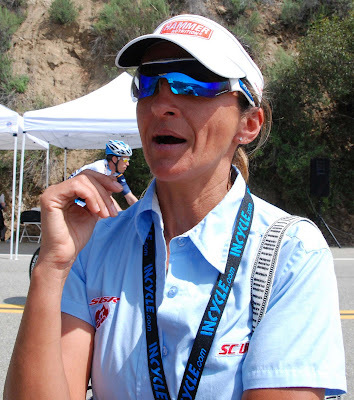 Suzy Degazon was a world class ultra triathlete. Her impressive array of accomplishes paled to her warm personality. The 3.8 mile race was a bit too short for her style. She preferred a 300 mile bike ride! Some folks commuted up the mountain during the race on their bikes. We fondly call them tourists on the race day. Some commanded more attention than others. Here was Mike S.
One never knows who you might meet during the race. In the afternoon as we followed the sun to catch the riders in good light. There was a tent, with table and chair manned by an enigmatic gentleman named Eric. It turns out he was a South Bay Wheelman who worked on the Manhattan Grand Prix Race and was the course director for Amgen Tour of California. He represented USA Cycling during SDSR and was noting which racers crossed the center line which is a 30 second violation. Bill noticed Eric's Canon Powershot G10 on the table. Eric asked how Bill and I could get along since Bill carried his Canon EOS Mark 5D and I was toting the Nikon D80, I laughed. The answer: both the cameras were Bill's. At the end of the day Matt and Bill met, talked about paper routes, growing up in Glendora and living on Lemon Avenue. It was a long day of standing, hiking, watching great cycling, and meeting new cycling friends. Once I am recovered, I am ready for my turn on the wheels. Friday March 20, 2009. 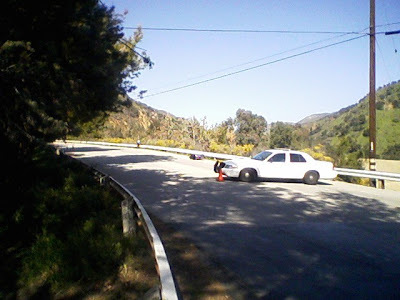 A 3.8 mile stretch of Glendora Mountain Road was the opening time trial to the three day 2009 San Dimas Stage Race. The transformation of a quiet wandering uphill terrain into a bustling carnival of 800 riders, their support personnel, equipment, attending race officials, and spectators brought out a few intrepid spectators. It was a day of sweat, determination and hopes as cyclists were launched one by one to meet their destiny. Today was a day where one group of road users, cyclists needed sole use of the road. There were heated words between cyclists and skate boarders when center line rules were not followed that nearly caused two cyclists to crash. Bill took over 700 photos today. GMR slacked off with only a couple hundred. Approximately 70 pictures have been posted. Photos on the web have been reduced. We took pictures from 9:30 am to 11:00 am and 13:30 to 16:39. If you like to make inquiries please contact: Bill. Include your start time and color of jersey. The ripe Chino grown strawberry tasted sweet and juicy as a pre-ride send off. The day was hot 85 to 91 F on the road. I was going to be happy just completing the ride with out falling over from heat. The afternoon sun made shade an enjoyable respite. My SDSR time was 33:45.
chain tension and chain speed. It then calculates the vibrational frequency of the chain – and thus chain tension – and derives power output from there. At the heart of this system is what is essentially an electric guitar pickup mounted to the chainstay. This sensor allows the frequency of vibration of the chain to be monitored by generating a voltage that is proportional to the up and down velocity of the chain. by measuring the chain tension and multiplying it by the chain speed. The small sensor that requires the replacement of one of the rear derailleur pulley screws measures the chain speed. If you like equations the second article does a nice job leading one around the mathematics. The CS600 measured my maximum speed at 31.4 mph. Sometimes one must stop, look and graph what they have done. Metrics. Numbers that can be charted for performance gains or losses. The two metrics I have chosen are time and speed. Next lets set the time range of chart the progress, say May 2008 to March 2009. In the chart below there are two groups of lines: Red for speed and Orange for time. The red jagged line spiking up and down is the average speed for the 3.8 miles of Glendora Mountain Road used for the San Dimas Stage Race. The straighter red line averages the averages of speed sloping upward to show that the average speed is getting faster which is good. The orange jagged line is the average time. 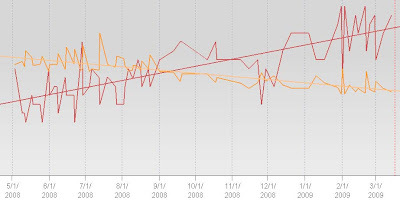 The straighter orange line averages the averages of time and is sloping downward indicating the time is getting shorter again good. Of course I have chosen values on the x-axis to show a difference. The cool moist grey clouds blown in on a breeze kept the traffic light today. A dozen motorcycles, same amount of cars and cyclists. 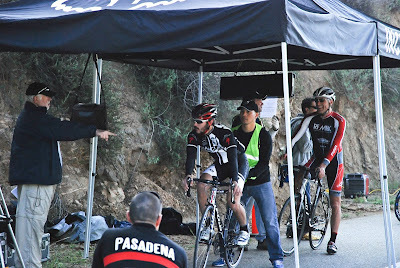 With the San Dimas Stage Race starting on Friday March 20, the surprise was fewer folks on the route than last year. There are certain moments that inspire, and to see a particular individual fly by at twice your pace with grace and ease, dancing on their pedals, hammering up the road, soaring. Emblazened upon my brain their fluid shape and strong rhythmic movement will fuel the next few weeks of training. Ascending several thousand feet nonstop, clear skies allowed the view from Glendora Mountain Road and the Monroe Truck trail to be its radiant awe inspiring self. Click for a larger view. The descent was cold. I used ski cap, gloves, thicker jacket and arm warmers. Riding down into the grey mist the visibility was adequate for riding but not for photos. SDSR time: 33:40. Monroe truck trail 1:16:15. 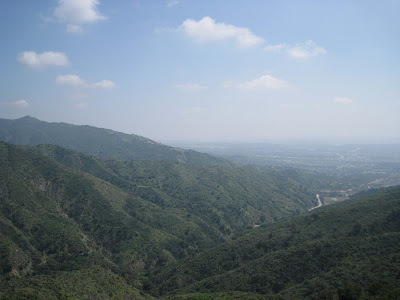 Glendora Mountain Road. A motorcyclist driving southbound lost control of his bike near the forestry station just north of Boulder Springs Drive and south of Big Dalton Canyon Road. The rider was thrown over the side rails, down the hillside and was air lifted approximately 3:30 pm to the county hospital this afternoon. The bike slid another 50-100 yards down the road. This portion of the road is under city jurisdiction. 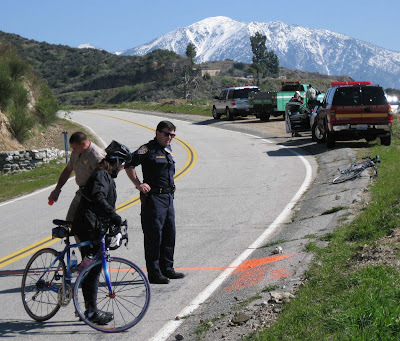 Glendora Police responded to the accident and had the road blocked to all through traffic. Personnel were actively taking photos, measurements and analyzing the scene at 5:30 pm. The road was expected to be opened in approximately one hour. There's a lot of dirt on the road so if the motorcyclists and autos could slow down it would be much appreciated. March 15,2009. Update: An off duty Montebello police officer Eric Bermudiz, 29 years old is in critical condition at the LA County-USC Medical Center after veering into the opposite lane and sailing over the guard rails. Lt. Rob Lamborghini is investigating the incident. The celebration of the change of time started at 4:10 pm when the car pool partner said let's hit the road. Heaven in deed. 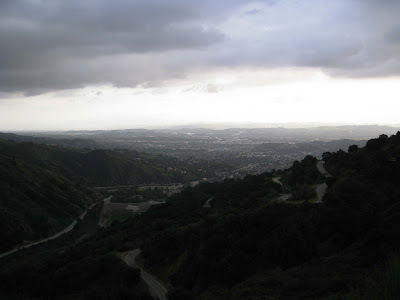 The sunny skies with a patchwork of clouds in Santa Ana gathered into a thick grey blanket swaddling the San Gabriel Valley. The freeway cooperated and I was home by 5:06. Perfect. Out the door and on the bike by 5:24. The electronic sign was on and flashing Road Closed Ahead. Closed East Fork. GRR. A few more screens and a date of March 11. It didn't sink in. I forged ahead thinking gate would be closed. It was open. OK, two more days before its closed. It was such a quiet ride, clouds, non-existent traffic and thus the clanking of the chain just wouldn't be remedied with trimming, up shifting, down shifting. Off the bike and check it out. When no weight was on it seemed ok. Perhaps the guilt of not cleaning the chain was haunting me. The quiet of the mountain, the quiet of the road. 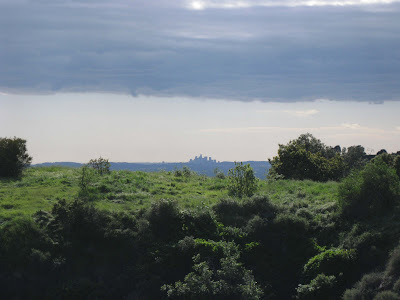 The rustling of leaves as I pedaled nosily past as small critters skittered farther into brush. I went to the wall at mile marker 11.39. Continued my clank check. It was 6:18 pm and darkness encroached. The purpose of this ride was logistics. Just do it. Create new habits. Windows of opportunity for mountain time. It was successful. On the way down I saw one other fellow cyclist on his way up. Respect. The mystery of the clank was discovered as I shook my foot. My shoe had lost its cleat plate. Gotta laugh. 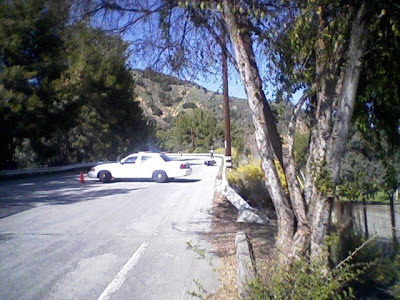 The Sunday traffic on Glendora Mountain Road was lighter than the Saturday flow. 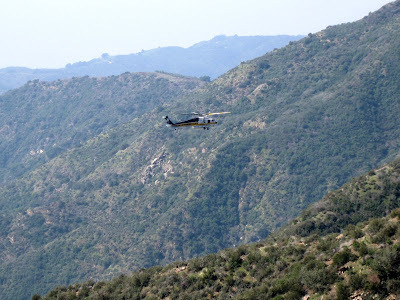 Noticeable on Sunday was the aerial support of the Sheriff's helicopter. It made multiple passes and hovered near the maintenance shed. 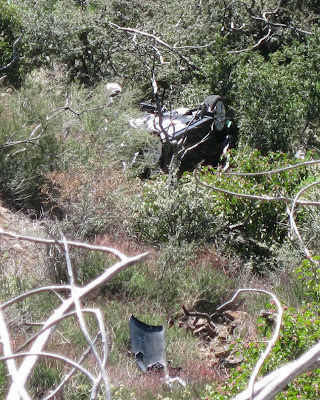 Two CHP officers ventured down the side of the mountain to investigate the vehicle. Subaru. recent model. 2008. It had gone over the side of the mountain. No bodies found. This was an old event as there wasn't any fresh dirt scrapings along the edge. A friendly CHP officer stopped one motorcyclist. The rider didn't have insurance or a valid California motorcycle license. It was rumored that the he would have to walk his bike home. I didn't see anyone pushing a motorcycle on the road, so perhaps he got off with a warning. With all the hoopla today, it was good to have CHP presence on the road reminding motorcyclists to drive slower. 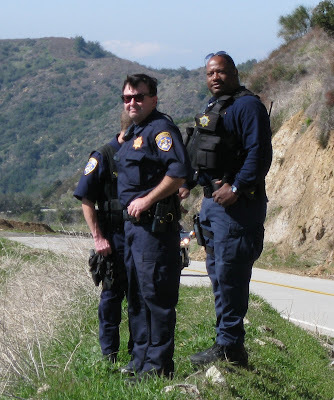 With the weather warming up it will be nice to have officers patrolling regularly. Lots of groups of cyclists, Simple Green, Sho-Air, Pasadena Triathlon Association. Rode non-stop from the electronic sign to Monroe Truck Trail.